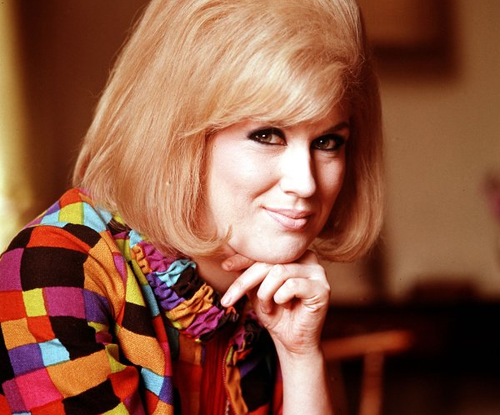 Dusty Springfield was born in 1939 and christened Mary Isabel Catherine Bernadette O'Brien. She came from Scottish Irish decent and her brother Tom, and Tim Filed made up a folk trio called The Springfields. The singing group enjoyed tremendous international success with hits including 'Island of dreams' and "Silver threads and golden needles." At their height of success the trio took the unprecedented step of dissolving the group and in 1963, Dusty started her solo career with, I only want to be with you. Many years later the same song was covered by the Tourists, which brought the record buying public's attention to the talents of another pop diva, Annie Lennox. Dusty spent a lot of time in the States with the Springfields and was exposed to the emerging all girl groups as well as the sound of Motown. This had a major impact on the young singer causing her to experiment with other vocal styles. Dusty had modest success in the US with versions of All cried out and Live it up but it was her next song written by Burt Bacharach and Hal David that confirmed her as, the voice. The tortuous ballad confounded her critics and became Dusty's third hit. Losing you, was written by her brother Tom and although Dusty was unsure it became her next hit. By now she was dubbed "Miss Beehive”, the Madge Simpson of pop, had hair piled above her head in bouffant style. One cannot help being reminded of all her devotees wearing their curlers on a Saturday morning, ready to rave it up at night. The heavy eye make-up gave Dusty a panda look, which set the trend for many of her fans. Her short-sightedness was supposed to be the cause of the thick eye make-up. The Dusty look suited the swinging sixties, and what more she was not just a pretty face she was also gifted with one of the most versatile singing voices of her time. Her next release Your hurtin kinda of love was not outrageously successful albeit the song was a particular favourite of the singer. By now she had earned the title Queen of the Mods and regularly appeared on Ready Steady Go. Dusty was an original sixties icon generating a real cult following. Whether this was due to her love of black soul music coupled with her ability to sing it or because she represented the older women next door, or a combination of both, remains an enigma. Dusty was really too old for miniskirts and knee high boots and it has been suggested by some, her popularity with young men especially, was her ability to express unspoken and desperate truths about sexuality that were not there for discussion by little boys. I still cannot look at her photographs without feeling a little adolescent guilt and warm longing for my own formative years. Because she left me ....... like the song, In the Middle of Nowhere. The song which proved to be her biggest selling hit in the US and was another penned by Burt Bacharach and Hal David. This duo had also written "Anyone who had a heart" which was a hit for Cilla Black in the UK and Dionne Warwick in the States. When Dusty first heard Bacharach and David's music she was so moved by their use of signatures in pop music she had to sit down. Dusty was of the opinion the song writers were more influential in popular music than even Lennon and McCartney. And she may have a point; certainly Elvis Costello would not disagree. Originally written for Dionne Warwick this was also covered by the Mersey Beats in the UK. Dusty's version, apart from being the favourite of the writers, certainly was the sexiest version with her velvet purring voice. The song gave her first major break as a solo artist in the states. She quickly followed this up with Goffin and King's Some of your loving. Dusty was asked to leave South Africa because she refused to appear in front of segregated audiences. Disappointed not to sing to South Africans her spirits were low when she returned to the UK. They soon picked up when she was asked to host a BBC television program. The Sound of Motown was a showcase of Motown music with the deliberate intention of introducing young people to the sound of the motor city. Dusty effortlessly dueted with many of the greats including: Tina Turner, Patti Labelle and Scott Walker. In 1966 Dusty had a number one in the UK with her brilliant and classy version of "You don't have to say you love me. " When Carol King heard Dusty's version of her song, the writer was so moved she reportedly burst into tears. Unlike her contemporaries Dusty was determined not to restrict herself to standard pop songs alone and used her albums to showcase her ability to handle soul, r&b, blues as well as Broadway show tunes and gospel folk. In the earlier years before Motown and Phil Spectre had impacted on the UK it was difficult to shake musicians to explore sounds, especially in a recording studio. She was determined to achieve her objectives and this gave her a reputation for being difficult in the studio. Dusty was a natural soul singer and like Marvin Gaye the calling came effortlessly. Few white singers had been so consistent in their active efforts to bring wider appreciation to this art form, than Dusty Springfield. When she sang soul she never tried to complete with traditional blues singers from the States instead she sang from the heart and her style encompassed a wide range of material. She did best on strong material and much of the technical production was down to her producers. She had a very impressive array of people in her production team, most of which had worked in the States with artists like the Drifters, Aretha Franklin and Wilson Pickett. Her muso's were also good and sometimes long suffering because she demanded perfection. The next song which is one of her finest was reputedly recorded in the ladies toilet at Philips studio. Be dogged by personal problems including drug addiction the lady tried to find herself and resettled in the US. Her Atlantic album Dusty in Memphis (1969) was produced Jerry Wexler, Tom Dowd and Arif Mardin, and is unmistakably her best recorded material. A brief return to the UK in 1978 let people know she was still around but it would take till the 80's before she came back with a vengeance. Teaming up with the Petshop Boys they released the single which was dedicated to techno-pop. Dusty's voice was perfect and once again she was, Queen of the May. Dusty's comeback with the Pet Shop Boys--"What Have I Done To Deserve This"--in 1987, gave the Diva her first top 10 hit in more than 20 years. It confirmed her increasingly obvious status as a gay icon, and showed Springfield that her sexuality had been accepted by her public. While recording her final album in 1994 she was diagnosed with breast cancer and after treatment and temporary remission she continued to work until 1999, when she passed away aged of 59. Ten days later she was inducted into the Rock and Roll of Fame. I just don't know what to do with myself(1964). Very efficiently written information. It will be supportive to anyone who utilizes it, including me.